Is the Christian faith illogical? Critics allege this of course. But surprisingly, many Christians also say that biblical faith is illogical, contrary to reason, and yet that we should hold to it anyway. Some would say that faith by its very nature is contrary to reason. Others would say that the core principles of the Bible defy logic: principles such as loving your enemies, that Jesus is both God and man, that we should rejoice in being persecuted for Christ’s sake, and so on. Aren’t these principles illogical? Many see faith in Christ as an emotional experience that transcends logic. Often certain Bible verses are used to support the notion that we should not rely upon logic or reason in spiritual matters. How are we to handle such claims? It is with great irony that those Christians who argue that we should not be logical when it comes to the Christian faith often appeal to Scripture to support their case. Essentially, they are attempting to provide a logical argument for why we should not provide logical arguments. The position is self-refuting. A thoughtful analysis of the cited verses shows that they are not against logical reasoning at all. But before we take a look at each of these claims, it is helpful to review what logic is, and what it is not. Logic is the principles of correct reasoning. To be logical is to reason rightly. And God always reasons rightly because His mind determines truth. Therefore, to be logical is to think in a way that is consistent with the nature of God. Biblically, we are supposed to emulate God’s character (Ephesians 5:1). 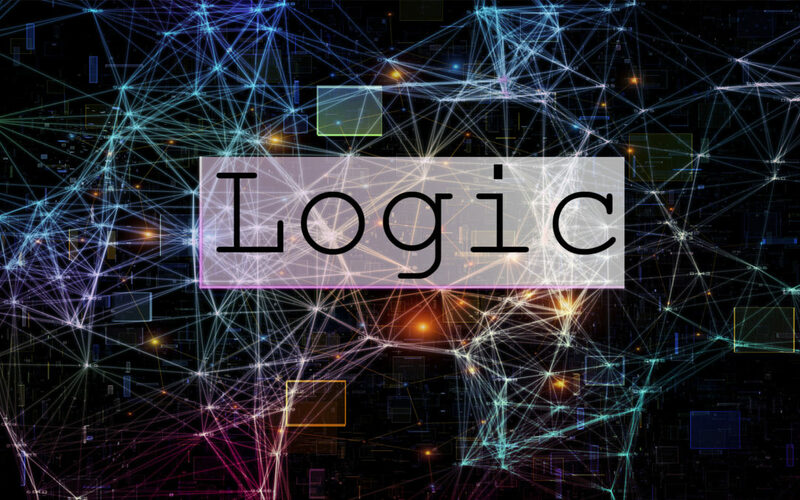 Therefore, we should be logical. We should turn away from thinking that is contrary to God’s thinking, and align our thoughts with God’s (Isaiah 55:7-8, Romans 12:2). Since God is rigorously self-consistent, the basic pattern of His thoughts can be described at least partly by exception-less, unchanging, universal laws. We call these laws of logic. For example, God never denies or contradicts Himself (2 Timothy 2:13). Therefore, truth will never contradict truth. We call this the law of non-contradiction. In order for something to be true, it must correspond to the mind of God. Therefore, truthful things will never violate laws of logic. Truth always matches God’s thinking, with no exceptions. Many people use the word “logical” when what they really mean is “intuitive.” Something is intuitive if it is natural to us and matches our expectations – our way of thinking. However, something is logical when it matches God’s way of thinking. And since our way of thinking does not always match God’s, what is logical is not always intuitive. People often conflate these very different principles. For example, some Christians might say, “it is not logical to love your enemies. But we must do so because the Bible commands it.” But what they really mean is, “it is not intuitive to love your enemies.” But loving your enemies violates no law of logic. It is perfectly rational. Christian principles are often contrary to our natural (sinful) intuition. But this is not because the Christian principles are illogical. Rather, our intuition often is illogical. We don’t always think rightly, and therefore the right principles of reasoning in Scripture often seem wrong to us. It is not the Scriptures that are illogical; it is we who are illogical (at times). This makes sense in light of passages like Proverbs 16:25, “There is a way which seems right to a man, But its end is the way of death.” We often reason wrongly because of our sin nature; the inevitable end of such irrational, unbiblical thinking is death. When God saves us, He begins a process of transforming our character to match His, and this includes our thought life (Romans 12:2). Over time, our intuition gradually comes into alignment with God’s. Eventually, many things that are logical but initially counter-intuitive will become intuitive to us. But this process takes time. Therefore, even as Christians, our intuition is sometimes still contrary to God’s Word, and will lead us into error if we follow our intuition rather than God’s Word. The Lord warns us not to rely on our intuition as the ultimate standard of truth, but to rely on His Word. Hence, Proverbs 3:5 states, “Trust in the Lord with all your heart, And do not lean on your own understanding.” This verse does not mean that we are supposed to abandon reason and understanding. Rather, our understanding must be rooted in God’s revelation, not rooted in our own fallible intuition. The word translated “lean” in Proverbs 3:5 means to support yourself. Thus, our thinking should not be based on our own fallible intuition, but on the character of God. The Bible is often counter-intuitive – contrary to our fallen sinful thinking. But it is never illogical. It is our fallen thinking that is often illogical. When we consider this important distinction, much confusion disappears. For example, it may be counter-intuitive to love your enemies. But it is perfectly logical. Our enemies are human beings made in the image of God. Of course we ought to love them. When people wrong us, our sin nature tempts us to repay evil for evil. But the right to repay belongs to God (Romans 12:19). He alone knows the thoughts and motives of a person, and is therefore the only one who is in a position to know exactly what the appropriate response for a wicked action should be. Furthermore, God is the Creator and owner of all things. So His right to repay is perfectly logical. Our natural tendency to repay evil for evil stems from an irrational arrogance; we think we know better than God. But, by showing forgiveness to our enemy as the Bible commands, we alleviate rather than exacerbate his hatred. In many cases, this causes his own conscience to condemn himself, and may lead to repentance and peace (Romans 2:15). It is always rational to obey God’s commands, and utterly irrational to disobey them. Perhaps you have heard the argument that Jesus cannot be both God and man because this is supposedly a contradiction. Such confusion stems from a very basic misunderstanding of what a contradiction entails. A contradiction would be “A and not-A at the same time and in the same sense” where “A” is any truth claim. It is not a contradiction to say (1) Jesus is God and (2) Jesus is man. It would be a contradiction to say that (1) Jesus is God and (2) Jesus is not God. But this latter claim is not biblical. Jesus can be both God and man because there is nothing in the nature of God that precludes God from adding the human nature to His own. Christ as both God and man may seem counterintuitive to some, but it violates no laws of logic. A common sentiment in today’s world is summarized by Mark Twain, “Faith is believing what you know ain’t so.” By this dubious definition, faith is necessarily irrational. After all, it is unreasonable to believe in something you know to be false. However, Twain’s comment is not the definition of faith. It is not the modern dictionary definition, and it certainly is not the biblical definition of faith. Biblical faith is rational confidence in something that is not observed by the senses. Hebrews 11:1 gives us essentially a definition of what faith is: a confidence, assurance, conviction, or evidence of things unseen. The Greek word translated as “evidence” or “conviction” in English translations of this verse is elegchos and has the basic meaning of “proof.” Biblical faith is not contrary to rational proof; rather, it is rational proof. It is the opposite of Twain’s misconception. Faith is confidence in what must be true. Faith in God is eminently logical. After all, God never lies (Titus 1:2, Numbers 23:19) and knows everything (John 16:30, Colossians 2:3, Isaiah 46:9-10). What He says is absolutely true and certain. We therefore have a very good reason to trust God’s Word. Wouldn’t it be utterly absurd to not have faith in that which cannot be wrong? But aren’t we supposed to have “childlike faith?” And aren’t children generally irrational in their thinking? So, shouldn’t our faith be a blind leap in the dark, rather than based on good reasons? In general, children are not very rational; they often do not have good reasons for their beliefs. The point of education is to help them to become rational and to abandon beliefs that lack good reasons (like the monster in the closet). Are we supposed to be this way in our faith? Actually, the Bible never tells us to have “childlike” faith. Rather, Jesus tell us that we must become as little children in order to enter the Kingdom of God (Matthew 18:3). However, the context of the passage deals with humility rather than faith (Matthew 18:4). Christ’s argument was that humility is required for pleasing God. Children often recognize their helpless, humble state; they depend on their parents for their very life and could not survive on their own. Likewise, if we are to be saved, we must recognize our helpless spiritual state; we must depend entirely on God’s saving grace, realizing that we cannot save ourselves. Now this is perfectly logical. It is rational for a child to trust in his or her parents; if they were not basically trustworthy in taking care of the child, he or she would not be alive. Likewise, it is rational for us to trust in God. And how much more so because God knows everything, is fully good, and never mistaken. God is the one who designed our sensory organs. If, hypothetically, God were deceptive, then we would have no basis for trusting our own observations. Therefore, if our sensory organs are to be considered basically trustworthy, then how much more should God be trusted? Clearly, faith in God is very logical. It is all too common today for people to think that faith in God is an emotional experience. Perhaps you have heard an atheist say, “I prayed and prayed for God to show Himself, but I felt nothing. So I just don’t believe in God.” This reasoning is absurd. It’s a bit like saying, “I looked at the multiplication table in school over and over, but felt no emotional connection to it. So I don’t believe in the multiplication table!” The multiplication table is true regardless of how you feel about it. Likewise, God exists and is who He claims to be regardless of your subjective emotions on the matter. My faith in God is not merely an emotional experience any more than my faith in the multiplication table. Don’t get me wrong. Faith in God can result in an emotional experience sometimes. In general, it is very satisfying to know God in a saving way. But emotions ebb and flow, and are notoriously unreliable; they are not a standard for truth. Nonetheless, people sometimes get the impression that our faith in God is emotion-based, perhaps based on verses that deal with trusting God with all our heart. We are to love God with all our heart (Deuteronomy 6:5, Matthew 22:37). We are to trust in Him with all our heart (Proverbs 3:5). Does this imply an emotional faith? We often think of our “heart” as the seat of our emotions. But biblically, the heart represents the core of our being. Even today, the word “heart” often has this connotation. When we speak of getting to the “heart of the matter” we mean the essential core. Therefore, to love God with all your heart means to love Him at the very core of your being. To trust God with all your heart means to trust Him completely. Neither of these verses is speaking primarily of emotions. More often than representing the seat of emotion, the biblical term “heart” refers to the seat of man’s intellect. In other words, it is often synonymous with the mind. Consider Genesis 6:5 where God saw the wickedness of man, “that every intent of the thoughts of his heart was only evil continually.” The phrase “thoughts of the heart” only makes sense if the heart thinks; it symbolizes man’s intellect in this passage. In Psalm 14:1, “The fool has said in his heart, ‘There is no God.’” Internal dialog is an intellectual action, which here is attributed to the heart. Clearly our faith in God is much more than a feeling. It is a rational, confidence in God that extends from the core of our being. Wisdom, or the Foolishness of God? Finally, we have those passages that seem to disparage wisdom in contrast to faith in the Gospel (e.g. 1 Corinthians 1:21). But wouldn’t that mean that faith is anti-wisdom, and therefore anti-logic? The key here (as with properly interpreting all Scripture) is context. Words like ‘wisdom’ and ‘foolishness’ can be used in an absolute sense, or in an apparent sense. When Paul speaks of the “wisdom of the world”, he refers to that which unbelieving people (the “world”) believe to be wisdom, not that which is genuine wisdom. The wisdom of the world is the best philosophy that unbelievers can generate. But it is not genuine wisdom at all. In 1 Corinthians 1:20 Paul rhetorically asks, “Has not God made foolish the wisdom of the world?” The only way that wisdom can be foolish (its opposite) is if we recognize that wisdom is being used in an apparent sense. In other words, God has shown that what the unbelieving world considers to be wisdom is in reality foolishness. The Bible is very pro-wisdom (Proverbs 4:5,7). But genuine wisdom always comes from God (Colossians 2:3, Proverbs 2:6, James 1:5). This isn’t to say that unbelievers never say anything wise; but they are only able to do so by relying upon biblical principles. In spiritual matters, secular thinking never arrives at the right answer. Hence, what the secular world considers to be wisdom, God knows to be foolish (1 Corinthians 1:20). With this in mind, we can correctly interpret and understand the message of 1 Corinthians chapter 1. Since the unbelieving world through its “wisdom” (what unbelievers consider to be wise) did not come to know God in a saving way, God delighted to use what the secular world considers to be foolish – namely preaching the Gospel – to save those who believe that Gospel (1 Corinthians 1:21). The Jews (knowledgeable of the Old Testament but not having as yet received Christ) ask for signs (of the Messiah), but the Greeks (these are unbelievers who reject the Bible) search for wisdom (22). We preach the Gospel – that Christ was crucified for atonement of sins – a message that causes the Jews to stumble, but which the unbelieving Greeks consider to be foolishness (23). But those that God calls – namely, the elect – whether they are Jews or not, recognize that Christ is the power and wisdom of God (24). The things of God that the world considers to be foolish are in fact far wiser than the wisest thing secular thought has produced (25). In fact, God doesn’t call many people who are wise by secular standards (26). He has instead chosen to use primarily people that the world considers to be foolish, to embarrass those unbelievers who are considered to be wise (27). That way, no one can boast before God (29). In Chapter 2, Paul continues his theme of the foolishness of what the unbelieving world considers to be wisdom. He begins in verse 1 to explain that he doesn’t attempt to use worldly “wisdom” or rhetoric when he proclaims the gospel – a theme he repeats in verse 4. That would be foolish. Paul relied on the power of the Gospel which is genuine wisdom. In verse 5 Paul explains why: our faith should not rest on secular “wisdom” (which is in reality foolishness) but on the power of God – which is genuine wisdom. Paul clarifies in verse 6-8 that he is not against genuine wisdom. On the contrary, we do speak genuine wisdom – that which comes from God. So these verses solidly refute the oft-repeated error that Paul is somehow against wisdom. Verse 13 clearly indicates that Paul is against human “wisdom” – e.g. secular thinking which is not genuine wisdom at all. Far from promoting irrationality, the Bible commands us to think logically – in a way that is consistent with the character of God (Isaiah 55:7-8). As one example, God does not contradict Himself (2 Timothy 2:13); therefore, neither should we (2 Corinthians 1:18). Far from being anti-wisdom, the Bible commands us to get wisdom (Proverbs 4:5,7, James 1:5). And genuine wisdom is always ultimately from God (Colossians 2:3, James 3:13-18). To be rational, one must have good, self-consistent reasons for his or her beliefs. The Bible provides us with such reasons for all those things that most people take for granted. Our mind has the capacity for rational thought because we are made in God’s image (Genesis 1:26-27). Our senses are basically reliable because they have been designed by God (Proverbs 20:12). The universe has order and consistency, having been designed and upheld by God (Hebrews 1:3). And we know that the universe will continue to have predictable cycles because God has told us so (Genesis 8:22). These prerequisites for knowledge are justified in the Bible, but not apart from it. Therefore, it is entirely rational to be a Christian, and entirely irrational to be anything else.